GreenGoose looks to unlock the data in everyday activities. Rather than ask people to integrate bulky or intrusive sensors into their lives, GreenGoose’s upcoming system (pre-orders start on Dec. 15; systems ship on Jan. 1) will instead provide small stickers with built-in Internet-connected sensors. Tip a water bottle and the attached GreenGoose sticker logs it through a small base station that plugs into your wireless router. Feed the dog, go for a walk, clean the house — GreenGoose has designs on all of it. No special skills required. 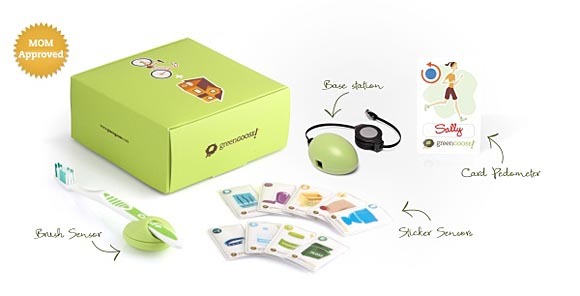 GreenGoose founder Brian Krejcarek calls his company’s sensors “elegantly playful.” In the following short interview, Krejcarek explains how the GreenGoose stickers will work and how he hopes people will use the data they acquire from their everyday activities. What will GreenGoose stickers measure? Brian Krejcarek: Our sensors measure things you do based on how you interact with an object. This interaction correlates to a signature of forces that our sensors try to match against known patterns that represent a specific behavior around the use of the object. When there’s a match, then we send a little wireless message from the sensor to the Internet. For example, you can put a sensor sticker on a medicine bottle or water bottle. There are certain patterns here — tip, dispense, return upright — that the sensors can pick up. Stickers are great for this because they’re simple, flexible and they easily stick to curved things like bottles. Also, existing objects or things around the house can be enabled with sensing capabilities by just sticking on a sticker. We’re taking everyday things and making them more fun. We’re also lowering barriers to adopting sensors by treating them in a playful way. We’re trying to make it really easy. There’s no batteries to recharge or USB cables or software to worry about. The sensors last more than a year, and the range is over 200 feet, so it’s completely in the background. We’re finding all kinds of new applications for these sensors. We’re going to be launching with sensors that target pets — measuring when you feed your pets or walk the dog, for instance. We’ve got about 50 or so other sensors in development right now that we will fairly quickly release over time. How are you applying gamification? Brian Krejcarek: We’re keeping the gamification side of this really simple to start. It’s all about making people smile and sharing a laugh as they do ordinary things throughout their day. No points, levels, or badges, necessarily. We’re first going to roll out a simple application ourselves around these pet sensors, but developers will have immediate access to the API and data they generate. We invite those developers to start layering on their own game mechanics. GreenGoose is a platform play. How do you think people will use the data your sensors gather? Brian Krejcarek: We hope that the use of the data fits nicely into applications that help people have more fun with everyday things they do. Think families and kids. Toward that end, we’ve got a bunch of sensors on the way for toys and doing things around the house. What lies ahead for GreenGoose? Brian Krejcarek: Plans going forward include launching the previously mentioned sensor kits around pets, releasing an open API to developers, and launching a sensor around physical movement (exercise) as a little card that can slip into your wallet or purse. We affectionately call it a “get-up-off-your-bum” sensor. No calorie tracking, or graphs and charts. More sensors will be released shortly afterward, too. A new era of post-productivity computing? Personal data is the future, but does anybody care?